Snow globs slid from bobbing cedar boughs. Blue jays perched on the topmost branches of a forked shagbark hickory tree, but remained silent. The air smelled damp and heavy, due to a warm west breeze that melted the packed, shin-deep snow. The hairs on the back of my neck twitched and tingled beneath a sweat-stained, checked neck scarf as my wool-lined winter moccasins still-hunted through Fred’s woods. The steep trail crested beyond the shagbark hickory. The still-hunt paused at a young oak, then at another hickory tree. In the meadow to the south, a button buck’s head popped up. The deer looked north, sniffed the air, then took two steps to the east. A young doe followed, exhibiting a similar caution. In a few minutes their mother stepped over the small knoll in the meadow’s center. As I peered around the hickory trunk, my head was below their hooves. A bland, gray evening sky backlit the whitetails. The button buck nuzzled the ground, but with the snow cover, he found no food and kept moving to the east. The young doe and its dam walked lightly, testing the air with great regularity. Before those three made it to the west edge of Fred’s woods, another trio appeared, then a pair. Dark brown eyes gazed in the direction of the tall hickory, but none detected the deadly shape that lurked behind that tree. The gentle wind was at their rumps, and they felt safe in the open, well within the reach of Old Turkey Feathers. They did not comprehend the danger, and I did not seek an antlerless deer, so perhaps there was nothing to comprehend. When all heads were down, I bent forward and backed downhill until the deer in the meadow disappeared from my sight. The roll of the hill now protected my movement as I stalked into a stand of old red cedar trees. Shuffling moccasins struck a churned up trail that cleaved the snowbanks. At the downed cedar tree that yielded a fine gobbler several springs before, I eased uphill once again, using a broad cedar to mask my movements. I saw two more does enter the meadow, following the path of the other whitetails. I stepped back and pressed on to the west, dipping down in the mouth of deep ravine. My moccasins slipped up the other side, forcing me to plunge my left hand into the snow to keep my balance. Legs milled about in the cedars on the west edge of the meadow. I spotted two deer ahead and knew I could advance no farther. A wild apple tree with all its main limbs broken and tented to the ground offered the best concealment. In my youth this tree was a favorite, offering succulent fruit in late summer. For a brief instant I mourned the apple’s passing, then I knelt and brushed away as much snow as I could from behind one of the branches. I eased the bedroll into the nest and sat for only a few seconds before a mature doe appeared to the west, not thirty-five paces distant. I devoured Long’s journal. I highlighted passages in yellow, underlined pertinent sentences in red and scribbled notes in the margins, especially the entries that related 18th-century hunting stories. Long described the making of a sweat lodge, the meanings woven into wampum belts and making fish hooks from the thigh bones of a hare. He told of an Indian shortening his trade gun with a file so it could be concealed under his blanket, drugging wine with “laudanum” (which the local pharmacist could not identify), and included a basic translation of English words into the Iroquois, “Algonkin” and “Chippeway” languages. As an aside, I find his “Chippeway” vocabulary interesting, because I have been taking a series of online Ojibwe webinars in hopes of gaining a rudimentary understanding of this complicated language for my new persona. After one of the lessons, I felt compelled to rummage through some of the old journals that include a Chippewa or Ojibwe dictionary. I spent time in the “Vocabulary” section at the end of Long’s journal (Long, 183). Most of the words are misspelled by today’s standards; dialect and location might be partly to blame. But when sounded out as Long wrote them, many of the translations are close to the proper pronunciation. As I thumbed through Long’s Chippeway dictionary, I found myself drawn back to his journal. I hadn’t opened this book in a number of years, by choice. Up until the dawn of the 21st century, I relied upon this for some of my primary documentation, as I do with many other 18th-century journals. Up until that time, I even quoted Long in a number of published articles. In the late 1990s or early in the 2000s, I picked up a copy of The Fur Trade Revisited: Selected Papers of the Sixth North American Fur Trade Conference, Mackinac Island, Michigan, 1991 from a publisher’s clearance table at the Borders bookstore in Ann Arbor. The book is quite thick and it took me a while to get through some of the papers. I didn’t read them all. Blanar’s paper unravels Long’s journal further, including passages that appear to be plagiarized from previously published authors. Needless to say, I was devastated. I tucked Long’s journal away in a dark corner of my bookshelves and hadn’t pulled it out until I got the urge to chase down Ojibwe dictionary’s from the past. As traditional black powder hunters, we sometimes lose sight of the fact that we are also living historians, as well. 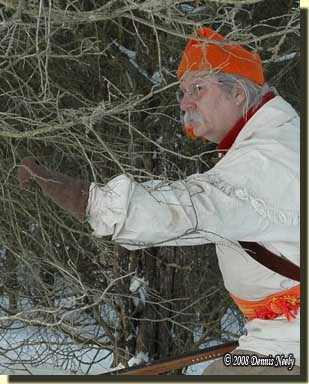 Not long ago, in a serious living history discussion with another traditional hunter, I made the statement that, given a choice, I would prefer to slip into the forest over attending a quality re-enactment or staying home to sew a new pair of leggins. As proof of that last statement, the leggins are not cut out after a year of trying—much to my discredit, I am content to use the old buckskin leggins. But we are all living historians, and as much as we enjoy the simple pursuit of game in a bygone era, we have an obligation to question the primary sources we love to quote. We do not need to take on the role of an investigative reporter, we simply need to be conscious of discrepancies and be a little more aware of who our hunter heroes really were. Slip into the forest of long ago, be safe and may God bless you. 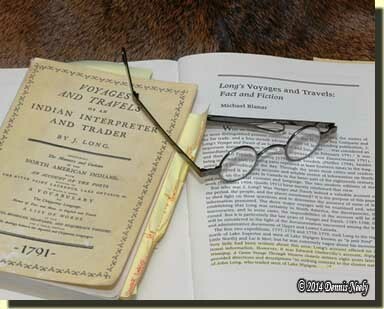 This entry was posted in Deer Hunts, Research and tagged Dennis Neely, historical trekking, Mountain Man, Native captive, North West trade gun, Northwest trade gun, traditional black powder, traditional black powder hunting, traditional blackpowder, traditional blackpowder hunting, Traditional Woodsman. Bookmark the permalink.